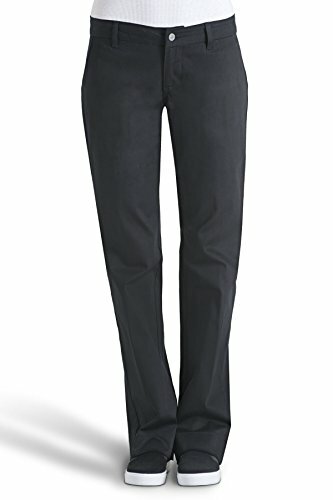 The Dickies Girl Bull Pant is a mid-rise boot cut pant with four pockets. The side slit and back welt pockets make it a "classic." This midrise, relaxed fit pant sits below the waist and is straight through the hip and thigh with a bootcut leg, creating a lengthening effect. The zip fly, button closure, contoured waistband, side slit front pockets and rear welt pockets are all constructed to assure a great fit. Our machine washable twill blend of 97% cotton and 3% spandex makes the ¡°Bull¡± easy to wear, wash and wear again.